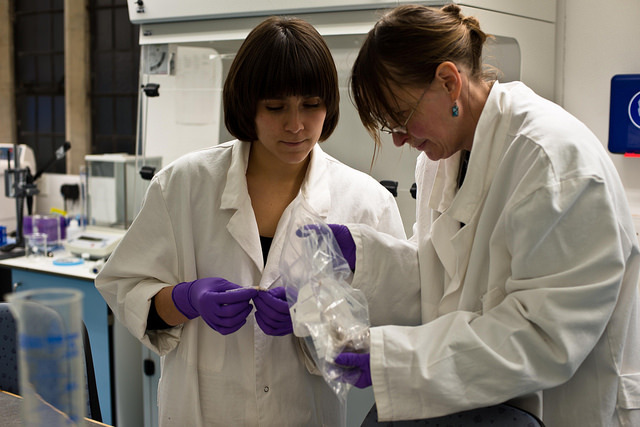 Two of the research fellows in the EUROTAST project, looking at samples in the lab at the University of Bristol. Last December I had the immense good fortune to join the Archaeology Department at the University of York as a EUROTAST Marie Curie Research Postdoctoral Fellow. I’ve been finding my legs in my new job for the last few months, getting the required equipment, and generally settling in. In practical terms, the position is familiar territory for me—digital media and public outreach—but the subject matter is a radical shift: new scientific methods of investigating the Transatlantic Slave Trade. While my first excavation investigated the home of formerly enslaved Dallas residents, with Dr. Maria Franklin at the University of Texas, and I have worked on historically disadvantaged and enslaved populations since that time, it was not my major research focus. Also, I understood (to a certain extent) the developments in archaeometry of the last decade, but the specifics were a gloss: I put the sample in a bag and sent it to a specialist who dealt with it. It has been incredibly eye-opening both in terms of the vast wealth of information that DNA and isotopic analyses has to offer in archaeological research and the emotional toll of studying what can only be described as one of the most tragic chapters in history: the Transatlantic Slave Trade. So. While my postdoc is incredibly amazing—I heard that it was called the “unicorns and rainbows job”—there is…this. How do I digitally remediate difficult heritage? What considerations do I take when I disseminate research on this incredibly sensitive topic, heritage that hurts? There’s also contending with the rather large new body of literature. I find this a benefit, as it provides an outside perspective that is valuable in outreach in demonstrating the interest and vitality of a subject that feels tedious to a long-term expert in the subject. Anyway, I’ve taken to calling my new job digital heritage on hard mode. Finally, it is fantastic being at the University of York. There’s great momentum in the Archaeology department and beyond, with the Centre for Digital Heritage, the Institute for the Public Understanding of the Past, and the presence of top researchers who are willing to try new things. And we do have some delights in store.